SMART-1 will end its three-year mission on Sunday, September 3, by crashing onto the surface of the Moon. 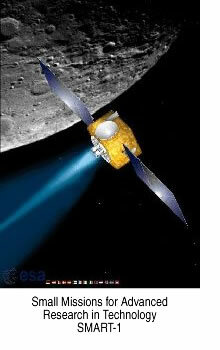 The European Space Agency’s (ESA) first lunar mission was designed to test new technologies, including an ion engine and miniaturized electronics, as well as to collect scientific data, including imagery and spectral data on surface mineralogy and the possible presence of water ice on the Moon. The spacecraft will impact the lunar surface at Lacus Excellentiae (latin for “Lake of Excellence”) at either 6:36 or 11:41 a.m. U.S. Central Standard Time. (The uncertainty in landing time is a result of incomplete knowledge of the specific lunar topography). At the time of impact, this area will be in darkness on the nearside of the Moon, and the impact will appear as a flash of light when viewed with a moderately powered telescope. ESA has called on observatories and amateur observers around the world to participate in observations of the Moon during this impact event. Of particular interest will be the impact region before and after the event and evidence of ejecta material ploughed up during impact.